After filing paperwork to trademark her daughter's name, Cardi B. is making more trademark moves. 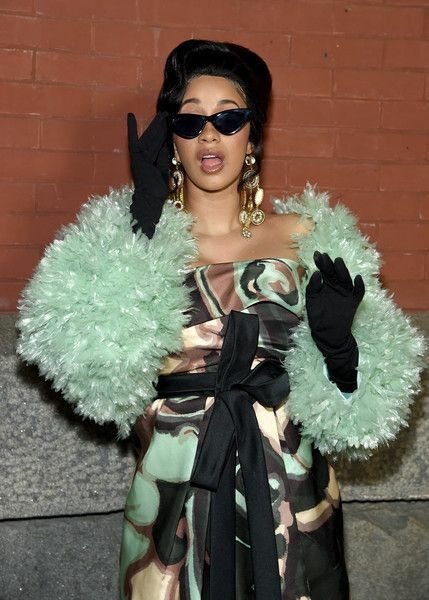 The "Money" rapper recently filed paperwork to trademark "OKURRR" because chick has some merch she's itching to release. According to The Blast, the NYC raptress is looking to put her catchy catchphrase on items for a clothing line, including shirts, pants and hoodies. She's also looking to put her signature saying on paper goods like cups and posters. She filed for the trademark on March 11th. By the way, she smartly filed the saying twice - with 3 R's and another version with 2 R's. It's a smart move for her because literally everyone says her famous catchphrase, from babies to grannies. "OKURRR" is here to stay, esp. since its been featured in her Pepsi commercials. We're sure she's going to use it when she makes her movie debut in the stripper flick, Hustlers. In case you missed, deets on the movie are HERE. City Girls rapper JT (real name Jatavia Johnson) is counting down the days before she's released from prison after turning herself in last year on fraudulent credit card charges. She's currently doing time in the Federal Correctional Institution in Tallahassee, Florida. The Miami rapper had someone post pictures of her on her official Instagram page where she thanked fans for their support and let them know she would be home soon. "The wait is almost over," she captioned with a purple grinning devil emoji. "Thank you so much for the love & support. I told yal that 2019 is City Girls year. PERIOD! #FreeJT." Recently, JT's City Girls rap partner/co-founder Yung Miami and Quality Control's Pierre "Pee" Thomas paid her visit. And we can't lie, chick looked fly, makeup and all. City Girls' success has been bittersweet due to JT's incarceration. The "Twerk" rapper went behind bars right when the group began to blow up. Yung Miami has been holding it down without her since she has been gone. According to the Federal Inmate Locator site, JT is scheduled to be released March 21, 2020, but she hints at an earlier release on IG.